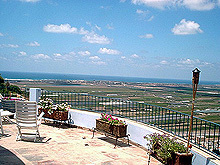 Zichron Yaacov, an old settlement or “Moshava” on the slope of Mount Carmel, is a combination of the Carmel and Coastal Plain encompassing a web of romantic views and pastoral tranquility. You will find unique tourist attractions, country-style accommodations, galleries, restaurants, cafes, and excellent wine in Zichron Yaacov, all with “taste of the past”. These and more make up the secret magic of the Zichron Yaacov which has conserved its character and color. Zichron Yaacov will lead tourists and visitors who come to discover the character of the Moshava, the settlement of the First Aliya, through a moving journey through time. For me, the history in the reconstructed streets and landmarks embrace the treasures of exciting events and stories. The Moshava is a combination of the old and the new, offering entertainment and relaxation, fresh and clean air. To experience. To discover. To enjoy. Best wishes for a pleasant and enjoyable stay. Villa for special family events are available. Music, bar, catering are optional. Aloha co.il specialize in marketing locations for conventions and events, conferences for corporations and public bodies for executives or fun days for companies to benefit their staff.